Just in case you’ve been living in a cave, especially a cave without any liquor stores in it, I have news for you – super aged bourbons are increasingly hard to find and even more increasingly pricey. Want a bottle of Pappy 20? You’ll need a whole lot of luck and just as much money in your wallet. Jefferson’s came out with a limited release of 21 year old bourbon (that they purchased from an unknown distiller) earlier this year, sating some of the demand, and actually their retail price was pretty reasonable at around $120 (and up). 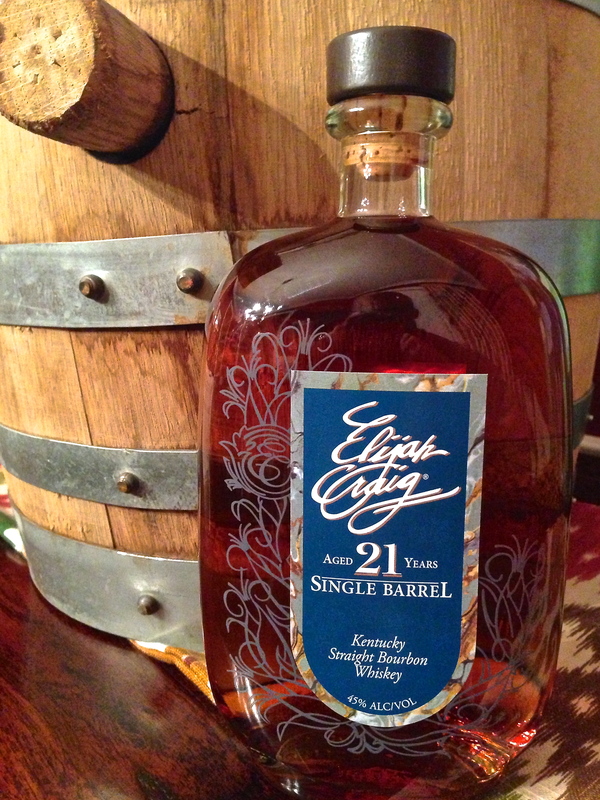 Now Elijah Craig has their own 21 year old, too. A year or so ago, Heaven Hill decided to do away with their year-round 18 year old Elijah Craig, in favor of limited releases of 20 plus year old stuff. Given the fervor for limited releases of older bourbon, that was probably a good business move, especially given the retail price difference between their 18 year old ($45 or so last year) and the new 21 year old release ($140). That said, Elijah Craig was priced attractively at 18 years old, and it’s priced attractively for a 21 year old bourbon of this quality as well. Word is that 22 year old and 23 year old releases are already in the works. The increasing rate of evaporation as bourbon ages means that every year of additional age makes what’s left in the barrel increasingly precious, so it will be interesting to see where the 22 and 23 year old prices land. Based on demand, they can probably go a good deal higher. But how about based on the merits of the 21 year old Elijah Craig? I should admit something right here – I’ve personally always preferred the 12 year old Elijah Craig to its 18 year old brother, mainly because the 18 just felt too wood heavy, too “over-oaked” in wine parlance. And the recently released 12 year old barrel proof Elijah Craig is a knockout of a bourbon, especially at roughly $40-$45 per bottle. 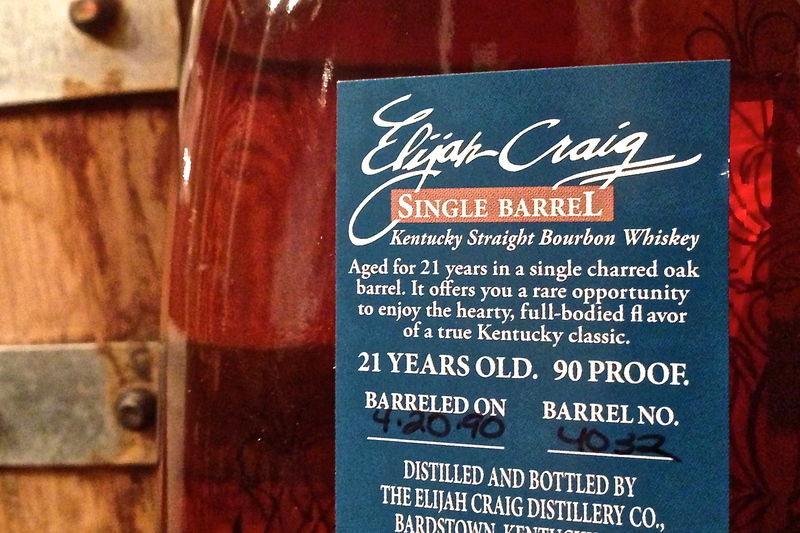 So, while I’m a big Elijah Craig fan, I was hopeful but not expecting to be blown away by the 21 year old. And the result? Read on. This old boy packs a punch to the nose – think sawdust baking in the summer heat in an old wooden barn. While you’re at it, imagine rum raisin mixed with a bit of purple grape. They work together surprisingly well. There are hints of rye spice underneath, but it’s not at all sharp or green. And the color is a moderately deep amber, clear and bright. This 21 year old has a strong and persistent burn on the tongue, not unpleasant, but… strong for 90 proof. It manages to be full and thick without feeling syrupy, with a mouth-coating presence that seeks out every nook and cranny. There’s an almost-burnt-caramel quality to it, but it doesn’t comes across as sweet since the wood and clove-like baking spices are there tackling the sugar. This may not help to say, but it feels old in a way that is neither astonishing (as in the Pappy 23 year old) nor upsetting (as in prior Elijah Craig bottlings). A sip of water before the bourbon brings out the velvety caramel notes and pushes the cinnamon forward more prominently as well. It rounds out in the mouth, not as powerful, not as assertive, but certainly more integrated. I think it benefits the bourbon greatly. With a cube of ice, the brute strength on the nose is dialed back, the fruity grape and cinnamon pear-like notes come through more. The ice, though, does make this Elijah Craig feel less… old. It takes away some of that aged patina. That’s not to say that it peels away the years, just that the presence of ice dulls some of the dusty character that’s just so hard to find. My preference is neat, with water as a companion – to keep the evident age of the bourbon but also help pull it together into a more harmonious whole. Elijah delivers here, avoiding the overly woody character of some of its well-aged forebears. If you want to experience an older bourbon, this is a great place to start – IF you can get your hands on a bottle. Do I like it better than the 12 year old barrel proof? No. Even if they were priced the same, I’d personally choose the 12 year old. But experiencing those additional nine years in the barrel makes this 21 year old a worthy exploration for those seeking an older whiskey. Also, please note that there WILL be variation from barrel to barrel – thus is the nature of single barrel bottlings. An aside: I hardly ever comment on the bottle itself – but I really like the elegant design on the glass here, a nice touch to elevate this from the other Elijah Craigs. Ain’t it pretty? I bought a bottle of the 21 YO yesterday and I won’t buy another. The oak overwhelms. The 18 YO was a better bourbon for a third of the price. Roger, sorry to hear that. Could be barrel variation, could be personal taste. I know the bottle I got didn’t show heavy wood relative to the 18yo I’ve had in the past. Over on straight bourbon.com they’ve been tracking “good” barrels vs. “not so good.” Last I saw there were about 7 barrels in the first camp and 2 in the second. So it goes with single barrel offers. Cracked one of my 22 year old very smooth distinctive Elijah Craig very nice oak taste not over whelming much like 21 year old. Very happy with my purchase though I am an 18, 20, 21 and now a very much 22 year old fan!